My name is Deepender Sehajpal a cycling enthusiast from Noida in India. I’m 46 years old, my wife Dr Preeti Tuli is a Senior Consultant at Max Healthcare in Delhi and we have a 15 years old daughter named Hershall. I’m passionate about cycling and I run the Audax India’s Noida Chapter where I’m involved in organising ultra distance rides as per Audax Club Parisen format and approvals. In the last three years with my club Noida Randonneurs long distance cycling has experience significant growth in the city. I’m a former Business Head and Chief Marketing Officer of a leading television media company in India. I have participated in and finished many cycling events including the prestigious Paris Brest Paris a 1200 KM ride in 2015 and Manali to Leh, a 480 KM ride through 5 highest passes in the world. 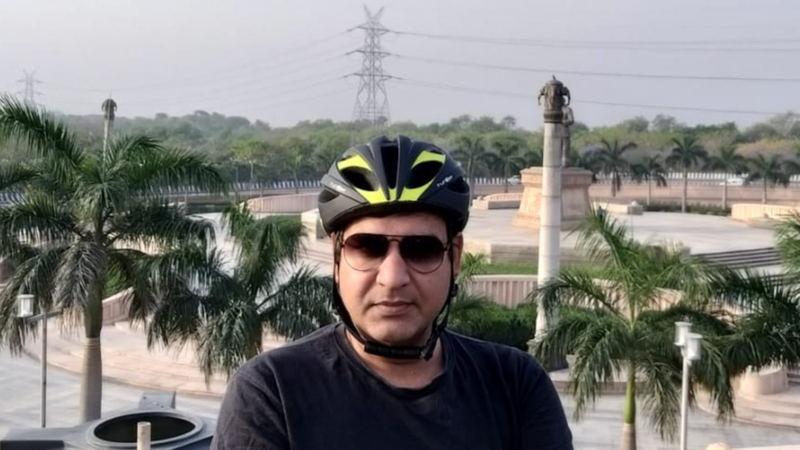 My mission is to tap in to the young urban population of Noida and encourage them to cycle to work and incorporate educational cycling programs across universities which are aplenty in Noida. I wish to work with government agencies to lay cycling tracks in feasible areas of the city for safer commuting. I also want to educate all cycling commuters, especially those from lower socio-economic backgrounds, on road safety and basic road rules such as using reflective vest and helmets. So overall my aim is to popularise cycling in the city and make it a safe option. The city has recently built a metro between the twin towns Noida and Greater Noida, however the last mile connection is a challenge at most stations. I think rental bicycles could be a viable option in this case. Also the cities cycling tracks have been usurped by hawkers and these need to be made available to riders. Another challenge is the weather, especially in summer. In order to encourage commuting by bicycle on campuses and offices solutions like shower areas for cyclists and cycle parking has to be provided. Cycling in campuses – educational and corporate to be launched and completed in next 6 months – we will begin with two corporate and two educational institutions to begin with as a pilot project. Safety for cyclists – various cycling clubs of the city hosting safety weeks and safety drills on a regular basis. Plus gas stations campaigns with number sticker campaign to sensitise motorists about sharing the road with cyclists. And working with employers who have a sizeable number of economically weaker sections of the workforce that commute on bicycles – to educate these riders about safety and create a fund to procure safety equipment for these riders. Working with Government bodies to identify the cycling tracks possibility, especially near educational campuses and to get a proper cycling track functional that’s free of encroachments. Noida has seen a rapid growth of cycling in the past few years there’s a lot of work to be done for cycling to become a mainstream activity. The stage is set with a metro and so many corporate offices and educational institutions I hope in a few years we will have some real work to share and showcase to other cities.